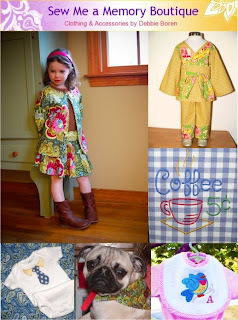 and adorable boutique outfits for your girly girl! and cool kitchen towels to make clean up time fun. so you'd best scamper over there! Doesn't she make adorable clothes!? You HAVE to go to this shop there are some great clothes in there!!! Too cute. Of course the dog is included. Whatever were you thinking? Cute article and great things for the little ones. Great items in this great shop, thanks for sharing. Darling shop ... so many cute things! What a cute shop. Welcome to the team. Nice to get to know sew and her great shop! oh how adorable- what a fabulous shop! Doesn't she just make adorable things? I love her shop! Welcome to the team! What an awesome feature. Love her shop! Cute feature! This shop will probably do really well! There are lots of stay at home moms on Etsy looking for unique clothing for their kids.